Click on the picture to get a full screen image. These Following Hems are good for an edge you don't want a ribbed edge on. Suitable for any guage machine. #1 A Picot Edge without Transferring a stitch. 1. To Cast on, bring number of Stitches required into work, and then push EON back out of work and cast on over these stitches. Using a Tension 1 full number less than garment Tension, Knit 10 rows over these needles. 2. Bring the needles in Non-working position back into work, and knit 14 rows over all these stitches. 4. T9 (garment tension). Knit across and continue the garment. NOTE: The underside of the hem has less rows than the top side of the hem...Depending on the yarn, you will need 3-6 rows less , and experimenting first before beginning the garment is a very good idea. #2. This is also a picot-type edge but needles are placed in Hold. 1. Cast on as usual over desired number of needles. 3. Now, place every 4th needle into Holding position. Place Carriage in Hold. 5. Now bring all needles into Hold position (for ease of knitting and to make sure you don't drop any of the stitches). Take Carriage off Hold. Knit 14 rows. 6. Hang the caston stitches back on the same needles. 7. Garment Tension (One full tension more than what you have been knitting at). Knit across all the stitches and continue your garment. VARIATION: Use a contrasting color for the 2 rows prior to the holding potion rows and the 2 rows after the holding position. Try any other color variations or???? 1. 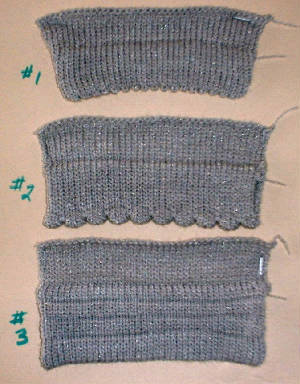 Cast on over desired number of needles as desired. 2. Hang the cast on edge back on the needles, pull all needles out to hold for ease of knitting. NOTE: THIS IS A SUGGESTION I DID NOT FOLLOW, AND I SHOULD HAVE!!! !....Knit the row that joins the hem after you have hung the cast on stitches one full tension larger than the garment tension. Then you hem should be more INVISIBLE!!! !